Black and white negative showing the Ontario Provincial Police headquarters on Gilbert Street. 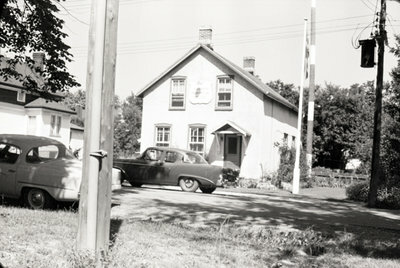 From 1950-1959, the Whitby detachment of the OPP was located at 306 Gilbert Street West in an old house on the north side between Centre and King Streets. The detachment moved to its new headquarters at Henry Street and Highway 401 in 1959. Ontario Provincial Police Headquarters, 1958, Jean Pretty, Whitby Archives, 08-004-002.